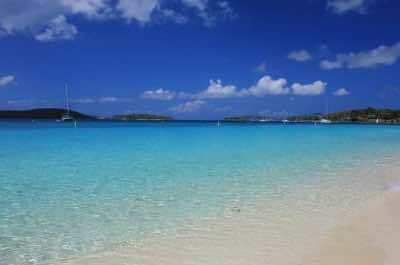 Here are the best beaches in St. Thomas, US. Virgin Islands. You will be surprised at the beauty, ease of access and wonderful watersport opportunities you will find when you visit them. You can find the perfect beach on St. Thomas like Magens Bay which sports a definite family attitude to the party atmosphere of Coki Point Beach to the seclusion of the inner city Brewer’s Bay Beach. There are a number of outstanding family beaches like Lindquist which even sports a bit of pink sand to Sapphire Beach with its dual personality of fun and sun to the quietness of Hull Bay Beach. Most the beaches here offer basic facilities like restrooms and many have local vendors selling food as well as souvenir items. No matter what you are looking for in a white sand beach, you are sure to find the perfect place under the sun on St. Thomas. If you are ready to spend some time on one of the best St. Thomas beaches, then you should head out to Magens Bay. 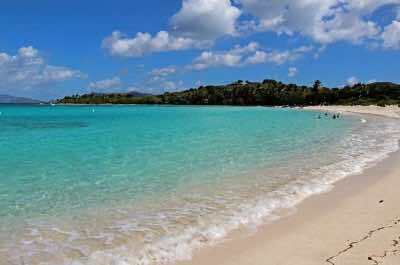 Located on the north-central shoreline of the island, Magens Bay is an ideal place to enjoy some beach time. 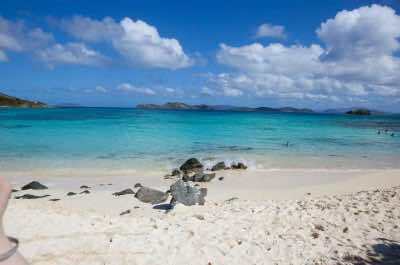 With over a mile of white sand Magens Bay has everything you want under sun and in the warm blue water. The protected bay is ideal for swimming, kayaking, standup paddleboarding or for parasailing and jet skiing. There is a nice nature trail that winds through the mangroves and tropical forest on a well-maintained boardwalk. 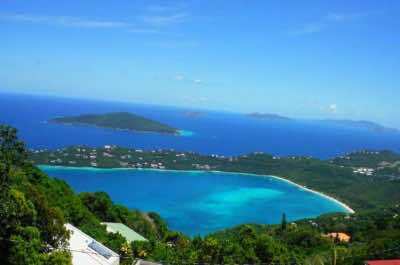 You can experience breathtaking views from the Magens Bay Lookout which is a favorite place for photographers. Magens Bay has all the facilities to make for a perfect day and there are several ways to explore Magens Bay from a sightseeing tour that includes historic sites to a half-day beach excursion only. 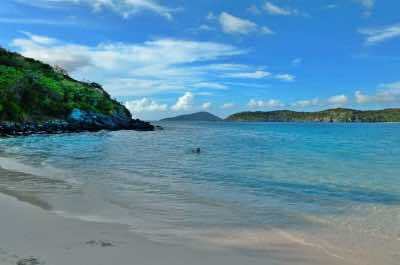 If you are searching for the one of the liveliest St. Thomas beaches, then you need to visit Coki Point Beach. Located on the northeastern coastline of the island, Coki Point Beach is a haven for beach goers of all types from families to young adults to seniors. 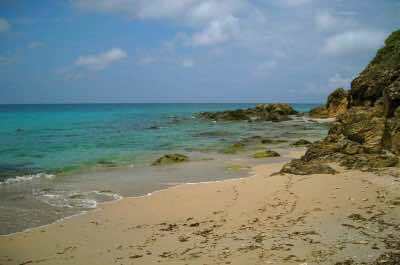 There are a plethora of activities on Coki Point Beach which is known as being the best snorkeling beach on the island. Scuba diving is also popular as well as just sitting on the white sand under an umbrella or renting a jet ski. Coki Point Beach has a boardwalk and bathhouse for your convenience with a number of beach vendors selling everything from food to drinks to souvenirs to hair braiding. Coki Point Beach is adjacent to the Coral World Ocean Park which sports some of the best coral reefs around the island and combined makes for the perfect day. 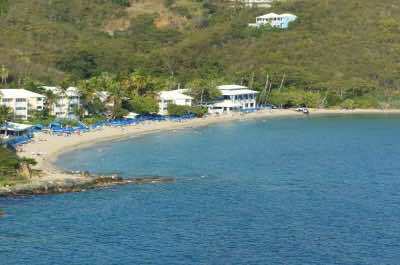 Sapphire Beach is an ideal St. Thomas Beach for cruise ship passengers, families as well as adventurers. Located on the northeastern shoreline of the island overlooking Saint John Bay, Sapphire Beach sports an impressive stretch of white sand with lots of water activities. Sapphire Beach has a laidback attitude with plenty of sea grape trees for shade on one side as well as a sunny side complete with iguanas and on clear days you can gaze out on the island of St. John in the distance. You can enjoy a wide variety of watersports from swimming to snorkeling and other non-motorized watersports to parasailing to jet skiing. If you like sailing there are a number of unique excursions that combine Sapphire Beach with sailing and watersport adventure. There are a number of beach vendors selling libations and souvenirs as well as more established restaurants like Slice VI Craft Pizza and Café. If you are looking for an alternative St. Thomas beach to Magens Bay or just want a little more seclusion than Sapphire Beach, then you should try Honeymoon Beach. Located on the southwestern shoreline of Water Island, Honeymoon Beach has a nice stretch of white sand with shade provided by coconut and sea grape trees. Honeymoon Beach boasts excellent swimming, snorkeling and a multitude of motorized as well as non-motorized watersports. You can purchase a day pass to enjoy all of your favorite watersport activities when you visit Honeymoon Beach. One of the best ways to visit Honeymoon Beach is within a snorkeling and/or a swimming with sea turtle excursion. There are hammocks and picnic tables available for families as well as several vendors of food like Dinghy’s Beach Bar and Grill. Lindquist Beach is one of the more pristine St. Thomas beaches for visitors to enjoy a variety of activities. Located on the northeastern coastline overlooking Smith Bay, Lindquist Beach is situated within the 21-acre Smith Bay Park. You will be thrilled with the beautiful white sand that has a touch of pink color. Lindquist Beach boasts great swimming and snorkeling is perfect. There are several shallow tide pools for lounging and the shoreline is dotted with sea grape as well as coconut trees for natural shade. Lindquist Beach has plenty of space to play beach games and families will enjoy the extra facilities for picnics. If you want to stop for a quick bite or drink nearby then try The Tap and Still Redhook for a delightful burger or De’ Coal Pot for Caribbean. If you are looking for a secluded St. Thomas beach which offers space and a variety of water activities, then you should visit Secret Harbour Beach. Located on the southeastern shoreline of the island overlooking Nazareth Bay, Secret Harbour Beach has a beautiful shite sand shoreline which is dotted with palm trees for natural shade. The protected bay at Secret Harbour Beach boasts excellent swimming and the snorkeling is ideal off the rocky coastline. There are a plethora of watersport activities here from playing on a raft to jet skiing to kayaking and an onsite dive shop to help you out with everything. Families will like the laidback attitude with smaller crowds and plenty of space to picnic. Secret Harbour Beach can satisfy your thirst at Sunset Grille while watching the sky turn into pastel colors at dusk and Island Time Pub has the perfect pub atmosphere. 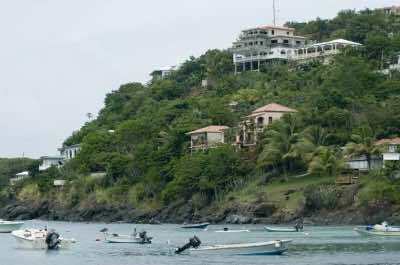 Morningstar Beach is a fantastic St. Thomas beach for people looking for the option of relaxing under an umbrella or spending the day full of adrenaline thrilled watersports. Located on the south central coastline overlooking Point Knoll, Morningstar Beach has a gorgeous stretch of white sand with limited natural shade. You can enjoy many things at Morningstar Beach from lounging to various watersport activities from parasailing to swimming to jet skiing to sailing. There are plenty of vendor’s onsite with equipment and umbrellas for rent to make for the perfect day without worries. An added bonus in the morning and afternoon is that you can watch the majesty of the cruise ships coming and going from port in Charlotte Amalie Harbor. There is plenty of room for picnics and families will enjoy the different amenities that include restaurants like the Smoking Rooster for barbeque as well as Coco Joe’s for Caribbean. 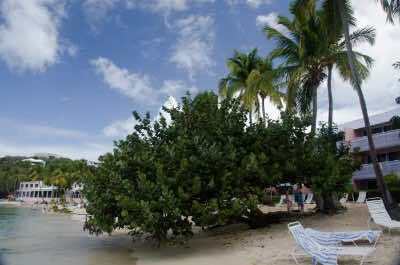 Limetree Beach also known as Bluebeard’s Beach is an ideal St. Thomas beach that offers seclusion and relaxation without the crowds. Located on the southeastern shoreline of island overlooking French Bay, Bluebeard’s Beach offers nice white sand and clam atmosphere. Swimming can be challenging here with a rocky entry into the water and the waves seem to be choppy for being within a natural cove. There is a dive center onsite that offers a variety of watersport equipment rentals. Many people just come to Bluebeard’s Beach to relax under the sun and read a book or just have a few drinks at sunset. If you get hungry then you can try Havana Blue for Latin cuisine and the SandBar is ideal for seafood. The area surrounding Bluebeard’s Beach is occupied by the Bluebeard’s Beach Club Time Share/Hotel. Hull Bay is a perfect alternative to Honeymoon Beach when you are searching for a St. Thomas Beach that is small and intimate as well as equipped with enough amenities for a whole day of fun. Located along the north central coastline of the island, Hull Bay boasts a beautiful white sand beach that is usually less occupied during the week. You can relax under a sea grape tree while you watch the local fisherman moor their boats in the harbor. You can enjoy all types of watersport adventure at Hull Bay and there is a dive shop onsite to help with rental equipment. Families often picnic at Hull Bay on the weekends and the atmosphere is perfect for fun. If you get thirsty or hungry and don’t want street vendor items then try Thirteen for pizza as well as contemporary cuisine. One of the best secluded and undeveloped St. Thomas beaches is Brewer’s Bay where you will find nothing but a stretch of white sand. Located on the south central portion of the island just west of the Cyril E. King Airport, Brewer’s Bay is within walking distance to the University of Virgin Island campus. Brewer’s Bay is a wonderful place of white sand that is scattered with sea grapes and palm trees for shade. Watersports such as swimming and snorkeling are popular here but there is no onsite dive center for equipment. Although families flock here on the weekends for picnic, there are no facilities other than restrooms onsite. You can however indulge in such island delights that include johnny cakes, saltfish pates as well as rice and beans from food truck vendors.